During the Allied victory celebrations there were few who chose to raise a glass to the staff. The high cost of casualties endured by the British army tarnished the reputation of the military planners, which has yet to recover. 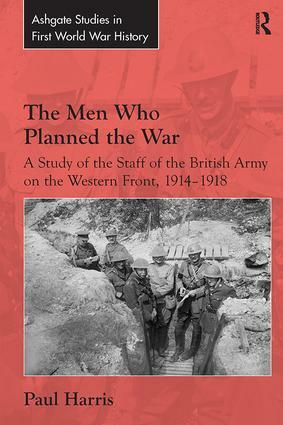 This book examines the work and development of the staff of the British army during the First World War and its critical role in the military leadership team. Their effectiveness was germane to the outcome of events in the front line but not enough consideration has been paid to this level of command and control, which has largely been overshadowed by the debate over generalship. This has painted an incomplete picture of the command function. Characterised as arrogant, remote and out of touch with the realities of the front line, the staff have been held responsible for the mismanagement of the war effort and profligate loss of lives in futile offensives. This book takes a different view. By using their letters and diaries it reveals fresh insights into their experience of the war. It shows that the staff made frequent visits to the front line and were no strangers to combat or hostile fire. Their work is also compared with their counterparts in the French and German armies, highlighting differences in practice and approach. In so doing, this study throws new light upon the characteristics, careers and working lives of these officers, investigating the ways in which they both embraced and resisted change. This offers evidence both for those who wish to exonerate the British command system on the basis of the learning process but also for those critical of its performance, thus advancing understanding of British military history in the First World War.